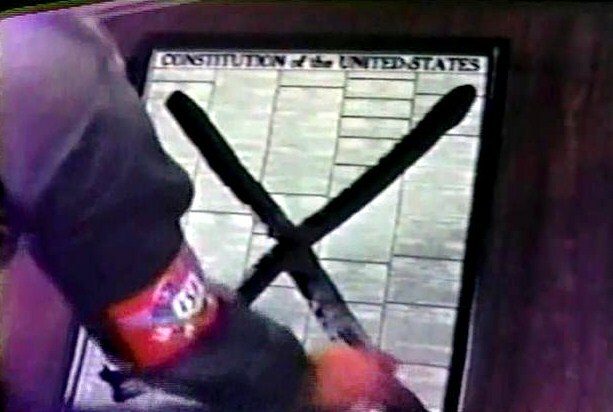 "These are the symbols of democracy. A democracy we take as for granted as the water we drink. But democracy is a living thing; its skeleton an ideal; its bloodstream dissent; its tissue comprised of all the people who inhabit it. All the people. But what happens if the life of democracy is paralyzed by fear, or greed, or simple laziness, and the country is yielded up, or co-erced, or persuaded into accepting a dictatorship, a leader whose word alone is all of law? The skeleton of democracy is destroyed, its bloodstream, dissent, is bound in the barbed wire of concentration camps. 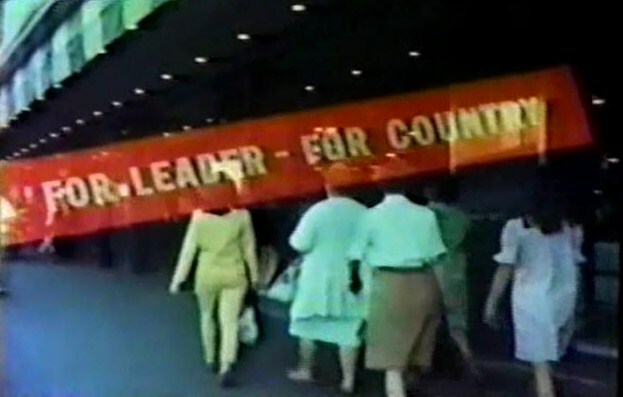 And the leader's special police...terrorize the bulk of the people into acceptance. And the flag of the Internal Security Forces -- the symbol of fear and darkness -- will fly over our land." - A Voice of "God" narration, from the opening of the TV-movie, Shadow on the Land (1968). The stirring and unsettling words printed above are accompanied on screen in Shadow on the Land by impressive views of national landmarks that we Americans hold dear: the Lincoln Memorial, the Capitol Building and the Washington Monument. Yet these words are also accompanied by images that terrify every American citizen, regardless of political stripe or political party: a giant black "X" marked through our country's Constitution; red arm-bands decorating the uniforms of a gestapo-like police force. This TV-movie created by Sidney Sheldon and written by Nedrick Young contemplates something that we all fervently hope is absolutely impossible: the rise of a fascist, totalitarian dystopia in America. It's a 1960s TV variation on Sinclair Lewis's classic 1935 literary work, It Can't Happen Here. In Shadow on the Land, The United States has been a dictatorship for some forty years, ever since the country's Leader exploited a national emergency ("riots in the ghetto" according to the screenplay) to seize total control of the nation and declare martial law. The people, in essence, gave the Leader "a blank check." Over the years since the takeover, "discipline" has replaced "freedom" in America as an ideal. Dissenters -- part of an organized resistance group called "Society of Man" -- are sent to detention camps where they are they are beaten and tortured. The police force, the ISF, is ubiquitous and well-armed. As the drama commences, an ISF officer, Colonel Andrew Davis (Jackie Cooper) is arrested by authorities for stealing documents pertaining to the Leader's new top-secret initiative, "Operation Hammer." Davis is hauled off to Detention Camp 12, and tortured for information. The resistance movement attacks the camp and rescues Davis in an extremely violent sequence with overturned cars, soldiers electrocuted on fences and bullet-ridden corpses. This night-time action scene is impressive as such on its own, but there's one important moment of undeniable real power here as well. In particular, two nameless Society of Man fighters attempt to bring down the ISF flag and fly our Stars and Stripes instead. The first man is gunned down viciously (on-screen). Without thought, a second man jumps into the breach and raises the flag...and is also gunned down with extreme-prejudice, right before our eyes. But the flag goes up; Old Glory reigns. This moment goes by quickly, and without comment, but it certainly makes a powerful statement. These two men died to make a symbolic gesture that few people would ever see (in this context of a night-time prison break). They didn't die freeing other men, or retreat to fight the good fight another day. Instead, they gave up their very lives in service of a representation of liberty. As I was sitting on my comfortable sofa watching this scene I tried to imagine myself in those men's shoes. Giving up my life -- everything I hold dear -- for the simple but powerful and universal idea of freedom. We've seen people doing this very thing, or something quite like it, in Tunisia, Egypt and Libya. Fighting to the death for the cause of freedom. But as Americans, we really haven't had to do that. We recently fought two wars, but most citizens haven't had to give up our sons or daughters to wage them. We haven't even had to endure tax hikes, or conserve our oil. How many Americans of today, I wonder, would sacrifice their personal futures just to see the U.S. flag raised? I'm no better or more noble than anyone else. And when I realized that, while watching this old TV movie, I was a little shaken. What would you and I do if you lived in the America portrayed in Shadow on the Land? Shadow on the Land delvers further into this concept. 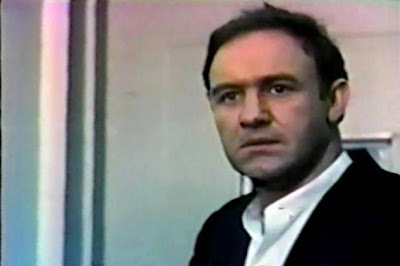 A high-ranking Colonel in the ISF, Shep McCloud (Marc Stanger) is actually working for the Resistance, and he delivers a wounded Davis to Davis' brother, a priest at the local Midnight Mission, played by Gene Hackman. This priest believes that all of life is a trial, one leading to death, and doesn't want to help his own biological brother. He says that he "renders unto Caesar that which is Caesar's" and that "God" should decide. But Shep insists...and he's a tough man to refuse. In fact, Shep needs a lot of help, from both the priest and from a lovely ISF psychologist, because Operation Hammer could mean an end to the Society of Man. On this very night -- Christmas Eve -- the Leader plans to stage a "false flag" operation, one equated to the the Reichstag fire in the teleplay. Specifically, ISF soldiers will dress as resistance fighters and attack a power plant control room in California, plunging the state into darkness and cold. This terrorist act, the Leader believes, will finally turn the nation against the Society, and pave the way for the enforcement of "new restrictions" and the doubling of the ISF force size. 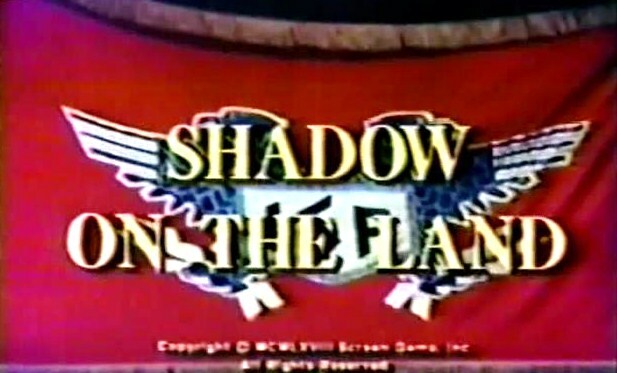 Most of this 1968 TV movie involves McCloud's attempts to prevent Operation Hammer from succeeding, and finding unexpected allies along the way. Even the hesitant priest comes to McCloud's aid, after Colonel Davis's death by torture. The movie ends at the dawn of Christmas, with the reminder that "there's always another battle to fight." One of the most interesting facets of Shadow on the Land is its alternate reality viewpoint. It is still the year 1968, but fascism has reigned in America for forty years, since 1928 ostensibly. Still, America in 1968 looks almost the same as we remember it. There are freeways, Christmas decorations, office meetings, restaurants, etc. The only difference is that no one is free. That concentration camps dot the landscape, and every park, every avenue, every building is is monitored by the ever-present ISF soldiers. Perhaps the tele-movie's second most powerful moment occurs when Davis attempts to find sanctuary following an ISF raid on the mission. He begs people for help in the park, in the streets, even in a diner. He tells them he's an army officer. He's bleeding, and desperate. And no one lifts a finger. No one even makes eye contact with him. The point transmitted by this scene is plain and clear: a fascist state depends on two things: a militia to bully people, and an apathetic, cowed populace. Again, this got me thinking. Who would I rather be? The guy who dies raising the flag? Or the guy staring down at his lunch plate as a free man is captured and tortured? 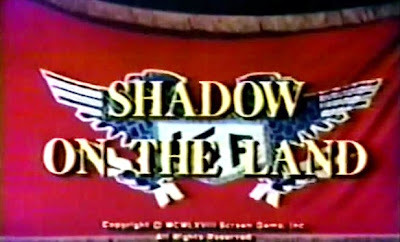 Shadow on the Land was apparently a backdoor pilot for a TV series. The concept was never picked up for broadcast, but I was struck how timely it seems today. For instance, the opening narration discusses America losing democracy in three ways. The second way is by greed, and indeed we saw Wall Street's sickening greed bring this great country to her knees in the Economic Meltdown of 2008. We bailed Wall Street out and now look where we are. They've got bonuses, and there's no money left for our schools, our workers, or, apparently, a middle class. Today, we worship wealth...and the rich. And third, finally, by laziness. So many voters are poorly educated, not taking the time to know the positions of the candidates they support, much less American history. In terms of action, Shadow on the Land is pretty-fast paced and brutal. And John Forsythe gives an, icy performance as high-ranking ISF officer, General Bruce. But again, while watching, I just kept thinking that something like this TV-movie could be done very effectively today, when we've moved into a more technological age, when both political parties have apparently accepted surveillance of U.S. citizens without oversight, and the right of American interests to torture anyone deemed an enemy. I also liked the film's notation that all the people in a democracy deserve equal rights. Not special rights...equal ones. This was a crucial point in 1968, a tumultuous year that saw the death of Martin Luther King Jr. and Robert Kennedy. It was the year of the riots at the Democratic National Convention in Chicago, too. Today, such issues are still with us.